Swindon Town owner Lee Power says he has put in about £6m of his own money to try and get the club promoted. Accounts published last week for 2017-18 showed the club made a £1.7m loss, with Power - who took over in December 2013 - loaning about £3m. "That's from two years ago, that's when they run from, since then it won't be far off double that now," Power told BBC Wiltshire. The Robins are currently 10th in League Two, having been relegated in 2017. "It stems from relegation," Power said of the £1.7m loss. "You do get more than the odd supporter who thinks there are other things going into this football club other than me putting millions of pounds in. "At least I hope that the supporters can see that I am funding this football club, I have done since day one when I've been here, but the accounts show that and being in this league turns out to be very expensive. "Contrary to reports, we've got one of the biggest budgets in this league and people can see that through those accounts." Power, who in a 10-year playing career appeared for Norwich, Bradford, Peterborough, Dundee, Hibernian and Plymouth, has become a successful businessman since retiring from the game. 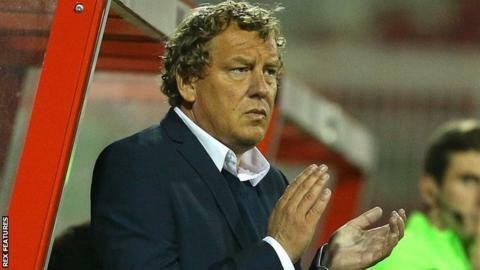 He put in £1.2m to lift a transfer embargo on Swindon when he first invested in the club just over six years ago before taking sole control 10 months later. Power hopes plans to improve the club's training facilities will be approved soon, while discussions are ongoing about buying the freehold of the County Ground from the local council. "I had a five-year plan and I haven't made it, we wanted to be in the Championship but we aren't," he said. "But if in a year or two years time, when we can get these deals across the line, if I wasn't to be here then at least owning our own stadium, having a training ground, I can attract a big investor that had more money than I have, to take it to the next level and then hopefully I've left a good legacy. "But until that time I need to get these thing done and keep investing in the team and hopefully get back to League One."